Supplies: Shorts (mine are from a second hand store for $5 each! ), doilies or trim, thick fabric. Pantry Supplies: needle and thread, embroidery thread, sewing pins, scissors, iron. 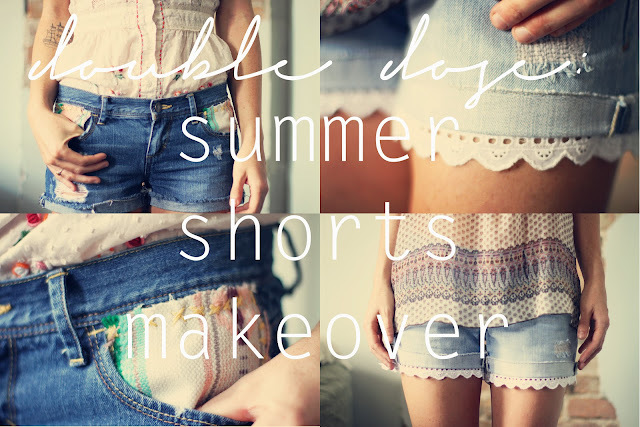 For the doily shorts, begin by ironing down a small fold on the hem of the shorts. Mine was about 1 1/2 inches. This will cover the thread when you stitch the trim/doilies on. Then, flip them inside out, lay the fold flat, and pin the trim/doilies around the hem. See how a bit of the shorts is longer than the trim? This is so that when it's folded back after it's sewn on, it won't show too much of the trim. Once it's pinned where you would like, sew it in place. Lastly, flip the shorts inside out and iron the fold again so that the trim peeks out the bottom. For the fabric pocket shorts, simply take a piece of fabric (I used a thrifted place mat! ), and cut it slightly larger than the size of the pocket. Then, stitch it in place with embroidery thread. 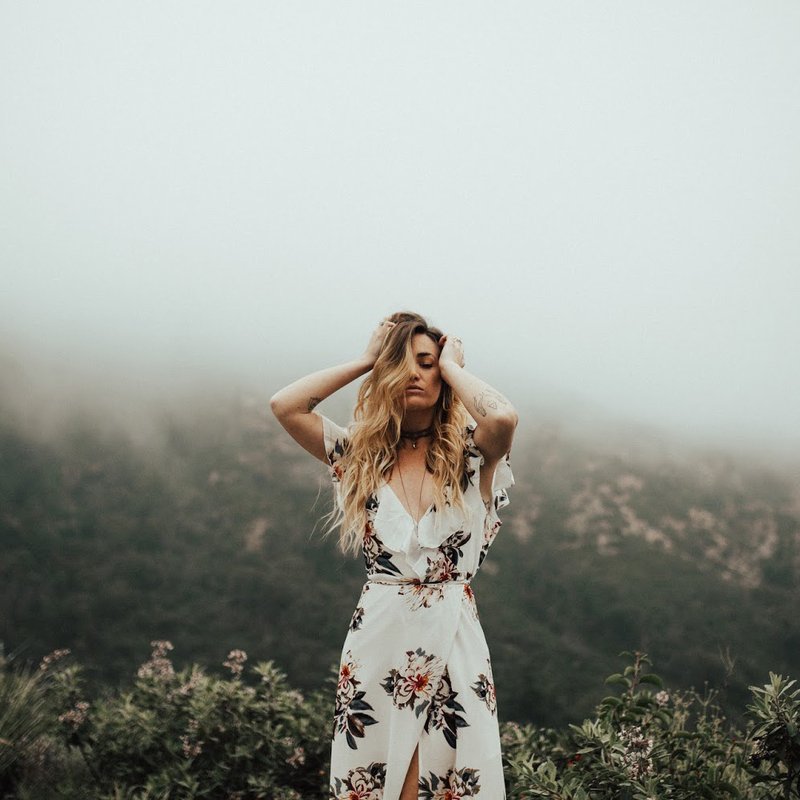 I chose to make mine messy with various stitches and stitching patterns. Lastly, trim off the excess. i looove the patchwork pair. I adore both, they are adorable and such a good idea! Love ALL of those. so creative. Oh, yes, I'd love to try these! 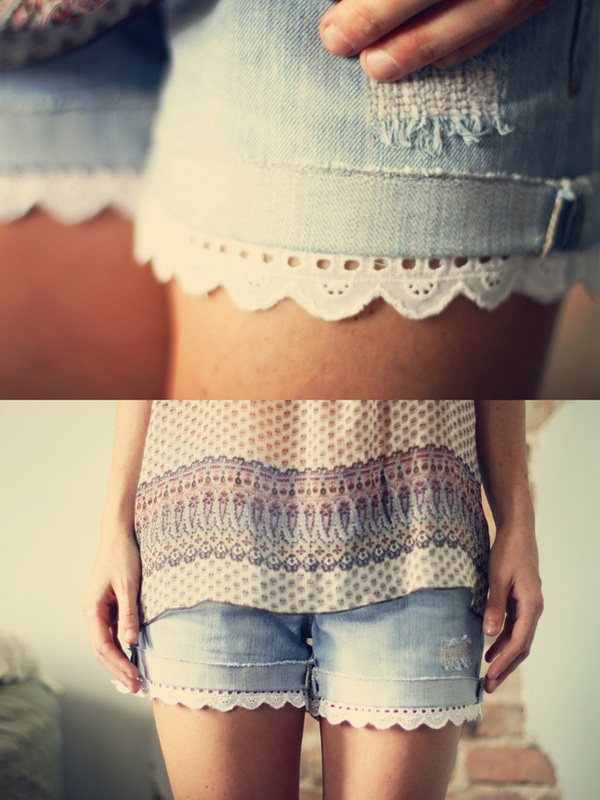 I've been thinking of sewing lace on my shorts too! So cute...I have a pair of jeans I will totally be doing this with! Thanks Kinsey! so cute! even though we're going into winter here in the southern hemisphere i may have to try this out! OMGOODNESS! How Cute! I really wanna try the pocket one! I love them both. So pretty! I think I have to try it with old jeans, cut and make them like yours. so inspirational and so lovely! I really admire your blog! I love your all creation...all are looking very pretty & graceful. I also try this thing. I want to do this! I really like the lacy-bottomed ones. I believe I'm making a trip to the thrift store today to scout for supplies! Oh, these are so adorable! Thanks for the ideas! Love these! This gives me a really good idea for a drawer full of old shorts I have. Thanks for the inspiration! These shorts make me super happy! Ready for summer love! had a go at the fabric pocket ones! totally cute, can't wait to wear them this summer!